More than two hundred and sixty species of Hieracium are recorded in Britain. Two hundred and forty-nine species are native. Weak-leaved Hawkweed (Hieracium attenuatifolium), Northroe Hawkweed (H. northroense) and Shetland Hawkweed (H. zetlandicum) are protected under Schedule 8 of the Wildlife and Countryside Act, 1981. Thirteen British miners are recorded on Hieracium. A key to the European miners recorded on Hieracium is provided in Bladmineerders van Europa. 1a >Stem-miner: A narrow, inconspicuous stem mine. Pupation at the end of the mine (Spencer, 1976: 64). On Achillea, Achillea millefolium and possibly Anthemis, Matricaria and Medicago sativa, but not yet on Hieracium, in Britain. In Britain widespread in south, not uncommon. On Anthemis, Achillea, Artemisia, Aster, Centaurea, Clinopodium, Crepis, Hieracium, Matricaria, Reichardia, Solidago, Tanacetum, Tripleurospermum, Medicago, Satureja and Stachys elsewhere. Widespread in continental Europe. 1b > Stem miner: An external stem mine with frass in two rows of disconnected strips. Pupation in stem at end of mine (Spencer, 1972b: 25; Spencer, 1976: 61 (fig. 63B), 65-6). Polyphagous. On Campanula, Jasione, Phyteuma [Campanulaceae], Crepis, Hypochaeris and Lapsana [Asteraceae], but not yet on Hieracium, in Britain and additional genera of both families elsewhere. Uncommon in Britain - recorded in London, Warwick and Cambridge. Uncommon but Widespread in continental Europe. 1c> Leaf miner: Mine primarily associated with mid-rib. 1d > Leaf miner: Mine not primarily associated with mid-rib. Polyphagous. On more than 40 host genera in 15 families, including Hieracium, in Britain. Widespread throughout Britain. Also recorded in the Republic of Ireland. Widespread in continental Europe. 2b > Leaf miner: A whitish blotch-mine along the mid-rib, with lateral offshoots into the leaf blade. 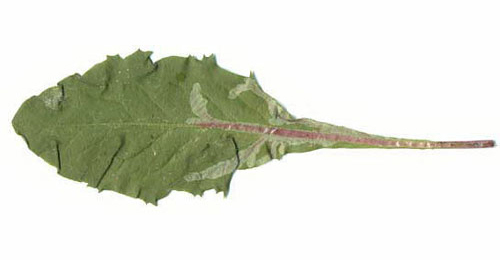 Pupation at base of leaf in petiole (Spencer, 1972b: 25). Broad corridor overlying the midrib, with short excursion into the blade, mainly in its basal part. Frass concentrated in the basal part of the mine, corridors almost free from frass. Pupation in the mine, also in the basal part (Bladmineerders van Europa). On Crepis, Hieracium, Hypochaeris, Leontodon, Picris, Pilosella, Sonchus and Taraxacum in Britain and additional genera of Asteraceae elsewhere. Widespread and common in Britain and continental Europe. Range extending east to Siberia. Also recorded from Canada. Ophiomyia pulicaria (Meigen, 1830) [Diptera: Agromyzidae]. 2c > Leaf miner: Mine mainly in basal leaves, running along mid-rib, with short lateral offshoots into leaf blade (Spencer, 1972b: 71). Pupation takes place within the petiole or mid-rib (Spencer, 1976: 489). Upper-surface corridor in the leaf base, radiating from the base of the midrib. Frass in long strings along the sides of the mine. Primary feeding lines quite conspicuous. Pupation within the mine, in the leaf base or even deeper in the plant (Bladmineerders van Europa). On Hieracium and Pilosella in Britain and elsewhere. Uncommon in Britain - Argyll, York and Warwick. Widespread in continental Europe. Phytomyza rufescens von Roser, 1840 [Diptera: Agromyzidae]. 3a > Leaf miner: Larva mining both lower and upper surface, unusually long, linear, conspicuously broad, frequently largely on the underside of the leaf. Pupation external (Spencer, 1972b: 76 (fig. 251); Spencer, 1976: 445 (fig. 780), 446). Phytomyza marginellaFallén, 1823 [Diptera: Agromyzidae]. 3b > Leaf-miner: Mine linear, whitish, both upper and lower surface. Pupation internal, at the end of the mine with the anterior spiracles projecting through the epidermis (Spencer, 1976: 433). Chromatomyia 'atricornis' has been recorded on Hieracium in Britain. 3c > Leaf miner: The mine begins with a very narrow full depth corridor, that ends upon the midrib. Subsequently a broad corridor, or rather an elongated blotch, is made overlying the midrib; from here broad, lobe-like extensions are made into the blade. Frass in discrete grains. Secondary feeding lines conspicuous. 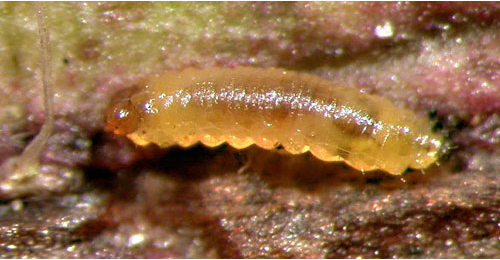 The larva is capable of leaving the mine and restarting in a new leaf, in which case the association with the midrib may be lost. Pupation after vacation of the mine (Bladmineerders van Europa). On Cichorium, Crepis, Hieracium and Taraxacum in Britain and additionally other genera of Asteraceae elsewhere. North-east Scotland, also throughout Ireland and continental Europe, except the Mediterranean area. 3d > Leaf miner: A small primary upper surface blotch (Spencer, 1976: 251). Primary upper-surface blotch. Pupation outside the mine (Bladmineerders van Europa). Liriomyza hieracii Kaltenbach, 1862 [Diptera: Agromyzidae]. 3e > Leaf-miner: A narrow upper surface linear branching mine without apparent feeding lines. Frass in isolated grains and pearl chains. At least in Erigeron older mines turn reddish-brown. Pupation external (Spencer, 1976: 413; Bladmineerders van Europa). On Erigeron acer and Erigeron canadensis, but not yet on Hieracium, in Britain and additional genera of Asteraceae elsewhere. Known only from Warwick in Britain. Widespread in continental Europe. Phytomyza erigerophila Hering, 1927 [Diptera: Agromyzidae]. 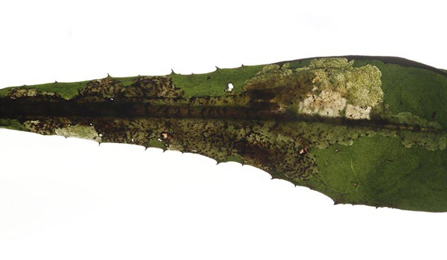 1a > Leaf-miner and case-bearer: The larva lives outside the mine, protected by a case, and feeds on the underlying plant tissues via a hole cut in the epidermis. From that point it eats away as much leaf tissue as it can reach without fully entering the mine. Mine does not contain frass (Coleophora species). Tubular silk case, about 9 mm long, trivalved, with a mouth angle of about 20° (Bladmineerders van Europa). On Bellis perennis and Solidago virgaurea, but not yet on Hieracium, in Britain and Aster amellus, Aster linosyris, Bellis perennis, Hieracium and Solidago virgaurea elsewhere. North Hants in Britain. Widespread in continental Europe. Coleophora ramosella Zeller, 1849 [Lepidoptera: Coleophoridae]. 1b > Leaf-miner and case-bearer: The larva lives outside the mine, protected by a case, and feeds on the underlying plant tissues via a hole cut in the epidermis. From that point it eats away as much leaf tissue as it can reach without fully entering the mine. Mine does not contain frass (Coleophora species). A straw-coloured, slender, three-valved tubular silken case; length about 10 mm, mouth angle 45° - 60°. Larva on the leaf underside. Perhaps because of the plant's dense felt cover, the case is attached with much silk, giving the holes a conspicuous white margin (Bladmineerders van Europa). On Achillea millefolium, Artemisia absinthium, Artemisia vulgaris, Aster, Leucanthemum vulgare, Tanacetum vulgare and possibly Hieracium in Britain and Achillea millefolium, Artemisia absinthium, Artemisia vulgaris, Leucanthemum vulgare, Tanacetum vulgare elsewhere. Widespread in Britain although there aren't many records. Widespread in continental Europe. 1c > Leaf-miner: The mine begins in the midrib, especially in a lower leaf, extending into the leaf disc, branching irregularly or pinnately, may also locally be blotch like. The mine is brown and very transparent. Sides very irregularly eaten out. Frass loosely dispersed or in a loose central line, buy may also be pressed against the sides of the corridor. The larva may also leave the mine and restart elsewhere (Bladmineerders van Europa). Polyphagous. On numerous genera and species in several plant families, including Hieracium, in Britain and elsewhere. Widespread in England and continental Europe. Also recorded in the Republic of Ireland.